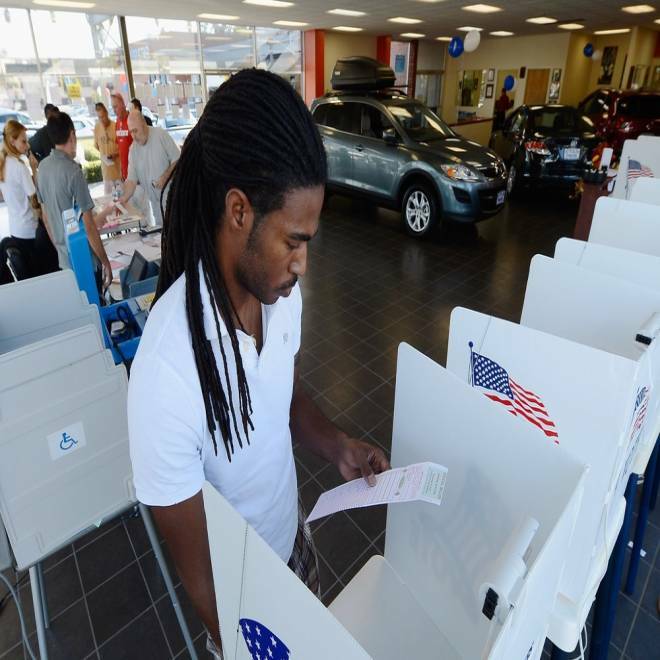 William Barney, 27, holds his ballot after voting in the US presidential election at the polling place of Star Mazda car dealership on Tuesday, Nov. 6, in Glendale, Calif.
WASHINGTON — Making history, America's blacks voted at higher rates than whites in 2012, lifting Democrat Barack Obama to victory amid voter apathy, particularly among young people, new census data show. Despite increasing population, the number of white voters declined for the first time since 1996. Blacks were the only race or ethnic group to show an increase in voter turnout in November, most notably in the Midwest and Southeastern U.S., the Census Bureau said Wednesday. The analysis, based on a sample survey of voters last year, is viewed as the best source of government data on turnout by race and ethnicity. The Associated Press reported last week that black voter turnout surpassed whites for the first time, based on an analysis by experts of earlier data. In all, about 66.2 percent of eligible black voters cast ballots in 2012, up from 64.7 percent in 2008, according to census data. That compares with non-Hispanic white turnout of 64.1 percent, which fell from 66.1 percent four years earlier. As recently as 1996, blacks had turnout rates 8 percentage points lower than non-Hispanic whites. Latino turnout dipped slightly, from 49.9 percent in 2008 to 48 percent, while Asian-American turnout was basically unchanged at 47 percent. Voter turnout across all race and ethnic groups fell for a second consecutive presidential election, from 64 percent in 2004 to 62 percent in November, according to the census figures. "Obama's win in 2012, despite the important Democratic constituency of young voters not participating at a high level, is good news," said Michael McDonald, a George Mason University professor who specializes in voter turnout. "The bad news is that voting is a habit — and the fact that we saw turnout declines among younger African-Americans suggests Democrats will have to work even harder to excite these voters in future elections." The data underscore how turnout plays an important role in elections for both whites and blacks, who will remain the two largest racial groups of eligible voters for the next decade. While Hispanics are now the fast-growing demographic group, they currently make up a smaller share of eligible voters because many are children and non-citizens, limiting their electoral impact for the immediate future. In 2012, the number of blacks who voted rose by 1.7 million. Hispanics added 1.4 million and Asian voters increased by 550,000. Meanwhile, even though the white population is slowly increasing, the number of white voters dropped by 2 million — the first drop in absolute terms for any race or ethnic group since 1996. By age, youth enthusiasm for voting fizzled in 2012. About 41 percent of voters age 18-24 cast ballots in November, down 7 percentage points from 2008. The drop was greatest among whites, whose turnout fell from 49 percent to 42 percent. But young black voters also saw big declines, from 55 percent in 2008 to 49 percent. That's compared with a decline among young Hispanics from 39 percent to 34 percent. The only subgroups showing increases in voter turnout were among blacks ages 45 to 64 as well as those 65 and older. "Blacks have been voting at higher rates, and the Hispanic and Asian populations are growing rapidly, yielding a more diverse electorate," said Thom File, a census sociologist who wrote the voting analysis. "Over the last five presidential elections, the share of voters who were racial or ethnic minorities rose from just over 1 in 6 in 1996 to more than 1 in 4 in 2012." "We do know the population is growing more diverse, and the electorate is growing more diverse in a different way," File added. White turnout declined in 39 states from 2008 to 2012, including presidential battleground states such as Ohio, Virginia and Florida. The gender gap in voting persists, a trend since 1996. About 64 percent of women voted, compared with 60 percent of men. Declines in voter turnout also were seen most notably among single people, the unemployed, renters and those with only a high school education or some college, suggesting in part voter disenchantment amid a sluggish economy. Black voter turnout surpassed that of whites mostly in the Midwest region, which covers Ohio, Indiana, Illinois, Wisconsin and Michigan, as well as the Southern U.S. region including Mississippi, Alabama, Georgia, Florida, North Carolina, South Carolina and Virginia. Demographers say the numbers pose long-term challenges for Republicans, given that 80 percent of nonwhites voted for Obama in November. Analyses by Brookings Institution demographer William H. Frey show that Republican Mitt Romney would have barely won the presidency if whites and other race groups had turned out at the same rates as they did in 2004, when black turnout was below its current historic levels. But if Democrats can replicate 2012 turnout rates in 2016, they would win the presidency, given current population trends, Frey said. Paul Taylor, executive vice president of the Pew Research Center, indicated the economy will be an important factor in future elections, noting that Hispanics and young people were among the hardest hit during the high unemployment years of 2008-2012. "Given what we know about the youth bulge in the population, Millennials and Hispanics will become ever more important voting blocs in upcoming presidential elections," Taylor said. "But in 2012, both groups left a lot of votes on the table." The census figures are based on the Current Population Survey as of November 2012. Since Hispanic is defined by the government as an ethnicity and not a race, census figures for "blacks" and "Asians" may include Hispanics. Census data for "white" refer to whites who are not of Hispanic ethnicity.